The Polar Vortex keeps coming at us. Yesterday I saw bus gridlock on the Upper East Side, jackknifed articulated buses which had sideswiped parked cars, and frozen people galore. But, you have to agree, it's pretty darn beautiful out there. So, get outside. Manage those multiple layers of fleece and silk, and head to the park. Here's a list of places for some mild to aggressive sledding in all five boroughs. 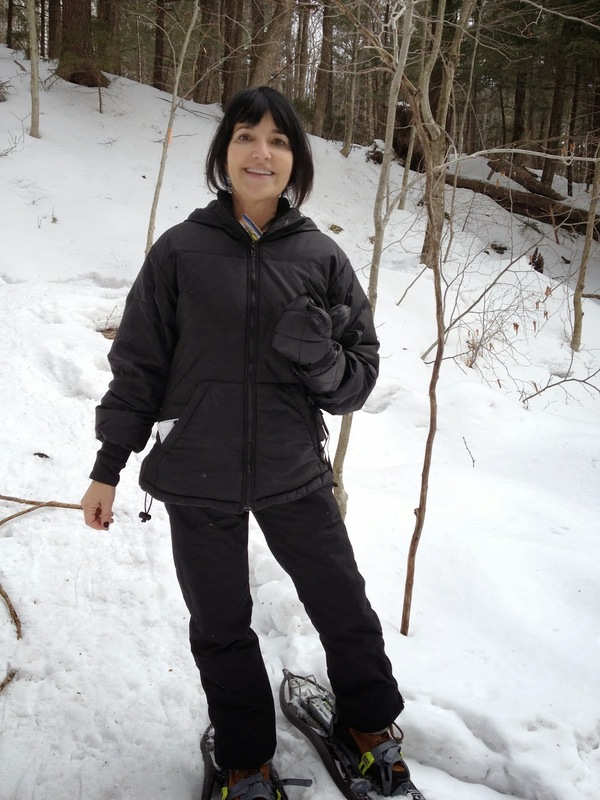 Or, choose like me, to make snow angels or go snowshoeing instead. After the freeze? Hot chocolate, naturellement, at some of the best places near the parks. Check out Vosges (try the spicy Mexican version), Starbucks (their seasonal-fave peppermint hot chocolate inspires dreams), Le Pain Quotidien (Belgian hot chocolate so rich you need to add milk to dilute it), or the dreamy, rich French version at Maison du Chocolat (with a thickness that conjures up the Left Bank). Cedar Hill in Central Park on the Upper East Side (Fifth Avenue between 76th and 79th streets) is my favorite Manhattan locale, but be prepared for lots of people. Pilgrim Hill in Central Park on the Upper East Side (Fifth Avenue and 72nd Street) – its long slope is my other favorite when I don't mind crowds and a bit of mania. Near the Metropolitan Museum on the Upper East Side (Central Park, Fifth Avenue and 8st Street) – the gentler slope here is great for little kids (behind the Ancient Playground). Riverside Park on the Upper West Side, Riverside Drive at 91st Street – much scarier; not recommended for children. There's a reason it's called "Suicide Park." Also on the Upper West Side, St. Nicholas Park has a long, steep hill that divides the Harlem side from the Morningside Heights side. At the northern most point of Manhattan, Inwood Hill Park has good sledding. Near Dyckman Street and the Hudson River. 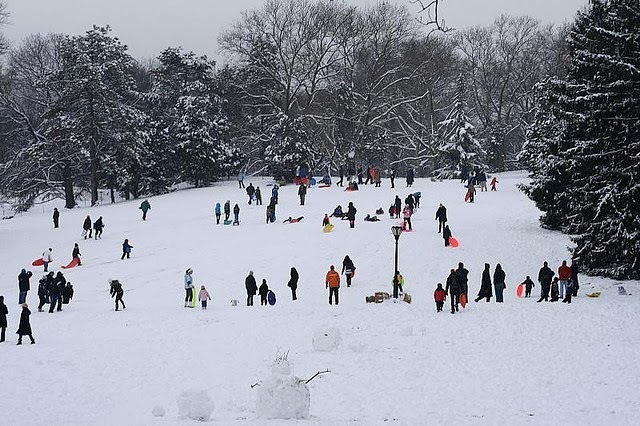 Forest Park – sledding is popular on the golf course with its three hills and at the Mary Whale Playground at 79th St and Park Lane South. Juniper Valley Park at 75th Street and Lower Highland Park. Crocheron Park along the bay offers both easy and steep hill sledding. 35th Avenue between the Cross Island Parkway and 215th Street. Check out Astoria Park's hills by entering at 19th Street and Shore Boulevard. Ewen Park – a steep hill with the added benefit of stairs to climb back up, Riverdale Avenue at 231st Street. 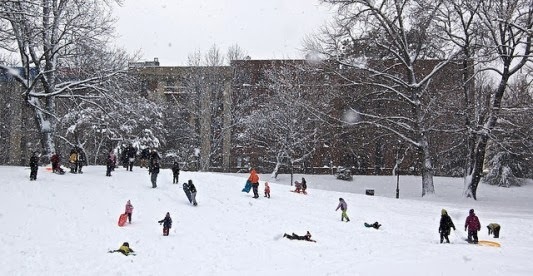 Van Cortland Park – Also in Riverdale, shallow hills but lots of areas to sled. This one is easy to get to via the 1 train to 242nd Street or the 4 train to Woodlawn. Yet another Riverdale spot, Henry Hudson Memorial Park will challenge you with its drops straight down to the Hudson River. Kappock Street near Palisade Avenue. Crotona Park at Fulton Ave between Crotona Park North and 172nd Street – a great area for kids of all ages. The slope is located behind the ballfield. Clove Lake Park – a family destination, Martling Avenue at Slosson Avenue. Dead Man's Hill in Silver Lake Park -- Enter at Forest Avenue and Victory Boulevard. Fort Greene Park – the steepest area of the park's four hills is at the back part of the hill leading down to Myrtle Avenue; the smallest hill is near Willoughby entrance of Myrtle Avenue. Entrance to the park is on Myrtle or DeKalb avenues. Sunset Park - Enter at 41st/44th Street and 5th Avenue. The hill is in the park between 42nd and 43rd streets. Great views of the State of Liberty, too. Owl’s Head Park in Bay Ridge (at Shore Parkway, Shore Road, Colonial Road and 68 Street). Hill is at Shore Road and 97th Street. Brooklyn Heights’ dog park by Harry Chapin Playground, near the Brooklyn Heights Promenade and Brooklyn Bridge Park. Clumber Corner in DUMBO near the BQE and Washington Street.